JOLIETTE, Que. - Raymond Gravel, a former Bloc Quebecois MP and well-known Quebec priest, has died. The diocese in Joliette says Gravel passed away from lung cancer Monday morning at the Centre hospitalier regional de Lanaudiere, northeast of Montreal. 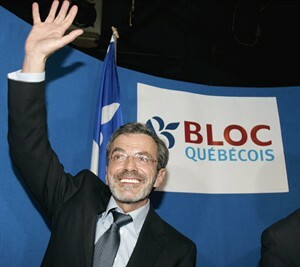 The outspoken social activist represented the Montreal-area riding of Repentigny in the Commons between 2006 and 2008. Gravel was known for his progressive stands on issues like homosexuality and the role of women in the church. During his time in Ottawa, Gravel faced attacks from anti-abortion organizations after displaying his support for Dr. Henry Morgentaler when the late physician received the Order of Canada in 2008. More recently, he was critical of the Parti Quebecois government's now-defunct proposed values charter, describing it in an open letter as "worthy of a dictatorship." He confirmed last October he'd been diagnosed with stage four lung cancer. Prime Minister Stephen Harper was among many to weigh in on the death of the popular priest, sending along his condolences through Twitter. "Laureen & I offer our condolences to the family of Raymond Gravel," the account read. "Raymond was a former colleague of mine from the HoC & will be missed." Opposition Leader Thomas Mulcair, the head of the NDP, and federal Liberal Leader Justin Trudeau also offered their condolences on the social media site. Montreal Mayor Denis Coderre also announced the Montreal city flag would be lowered to half staff in Gravel's honour. Louis Plamondon, the dean of the four-member Bloc caucus in Parliament, said in an interview that he often had supper with Gravel and the occasion was like a philosophy course. "He was a great humanitarian," Plamondon said, noting that Gravel "loved" his experience in politics. Veronique Hivon, a former PQ cabinet minister, said Gravel's support had helped advance her bill to legalize physician-assisted death for the terminally ill in Quebec. "He was not afraid to go counter to the established positions of the church," she said. "He added a voice of wisdom, humanity and compassion to the debate." Hivon, who last saw Gravel on June 24, also praised him for his efforts to reform the Catholic Church. She said he told her it is important to fight for your convictions. "I admired him greatly for that," she said. "When you are part of an institution, it's hard to change things and some people give up. "He was the antithesis of that." A funeral will be held Friday afternoon in Joliette.